Before we start, I'd really appreciate it if you took the time to vote for my blog in the Saveur Magazine's Food Blog Awards. Hummingbird High is a finalist in the Best Baking & Desserts Blog category!!! I am beyond floored that my blog was even re-nominated in the first place; it's honestly because of all YOUR support. So thank you to everybody who took the time to nominate me, is taking the time to vote for me, or, honestly, is even just reading this at all. And a HUGE congrats to all the other nominees, of course — I can't wait to meet everybody in June! To vote for me, head on over to SAVEUR Blog Awards. There's an ice cream shop in my neighborhood that's famous for their crazy ice cream flavors. You'll frequently find flavors like Pear and Blue Cheese or Tomato Water and Olive Oil on the menu. On Thanksgiving, Salt & Straw rolls out a salted caramel ice cream that's flavored with turkey juice and caramelized onions. One summer, there was a flavor that combined berries, barbecue sauce, and baked beans. As a dessert enthusiast, I dive right in. I'll try a scoop of everything, including the ice creams with the pig's blood (Blood Pudding flavor, usually shows up around Halloween, yup), the meat juices, and even sea urchin. Do I enjoy it all? I know that makes me a bad Portlander, and I'm sure as I write this, the locals are gearing up to throw me some sticks and stones like they did in the comments section of this article. But maybe I'm just a simpleton at heart because the flavors I like best are their "classic" ones: chocolate gooey brownie, coconut with caramel bars, and Stumptown coffee with bourbon. Every so often, however, I'll try one of their seasonal flavors and be blown right out of the water. Last month, it was a flavor called "Pots of Gold & Rainbows", a cereal milk based ice cream that was studded with all the marshmallows from pounds and pounds of Lucky Charms cereal but without any of their whole grain companions (because let's be honest, the only people who eat Lucky Charms cereal do it for the marshmallows, AMIRITE). It was perfect. There's no other word for it — the ice cream hit the perfect mix of creativity and deliciousness, balancing somewhere between a timeless classic and a more disruptive future demanding change amongst tried and true flavors. I found myself craving the ice cream again and again, lining up in Salt & Straw's obscenely long lines twice a week to buy myself a rather pricey scoop of the stuff. To reverse engineer the ice cream at home, I started by flipping through the Momofuku Milk Bar cookbook. 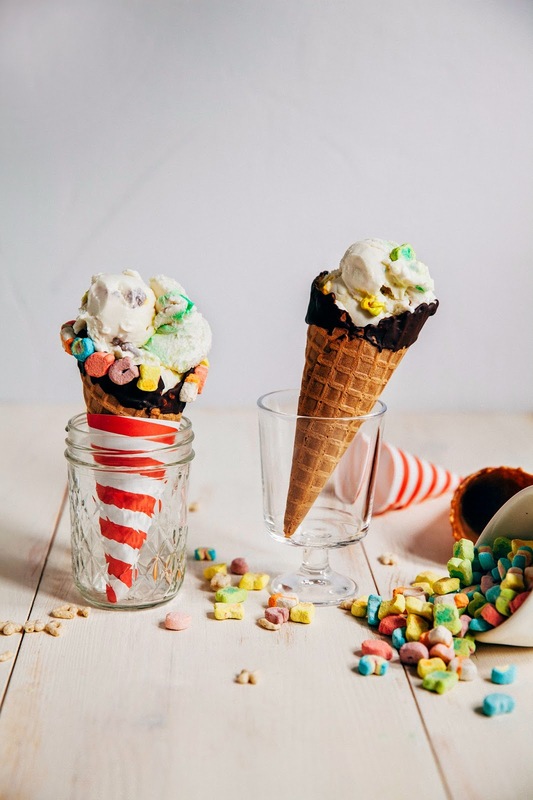 Cereal milk dessert isn't a Salt & Straw invention; instead, it was popularized a few years ago by famed pastry chef Christina Tosi of Momofuku Milk Bar fame. Her New York bakeries actually sell cereal milk by the bottle, and she has pretty solid recipe for cereal milk that I've used in previous recipes (like these cupcakes!). But honestly, it's something that you could easily make without one, AND, if you eat cereal for breakfast every day, you probably already even do. Because here's the secret: cereal milk is nothing but cereal-infused milk. Like you know how when you eat a bowl of cereal, the leftover milk in the bowl once you've eaten all the cereal will have all these tiny cereal crumbs and will taste a little bit like the cereal you just ate? THAT'S CEREAL MILK. That's it. That's all! Seriously. And so after sorting out the marshmallows (more on that later, grumble), I used the leftover whole grain cereal to make the cereal milk, which I then used in my favorite vanilla ice cream recipe (from Humphry Slocombe, a San Francisco-based ice cream parlor also known for its crazy flavors), churned it all into my ice cream maker, and hand-stirred in the remaining Lucky Charms marshmallows. Oh! And let's not forget — because I am a hedonist, I also bought some waffle cones, dipped them in some melted chocolate and marshmallows and BOOM! 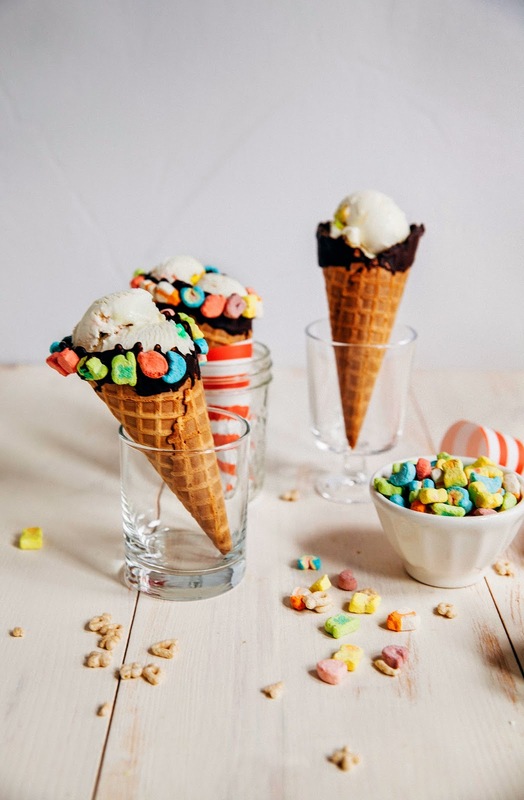 Chocolate and Lucky Charms marshmallow-lined waffle cones. Thank you, and good night. 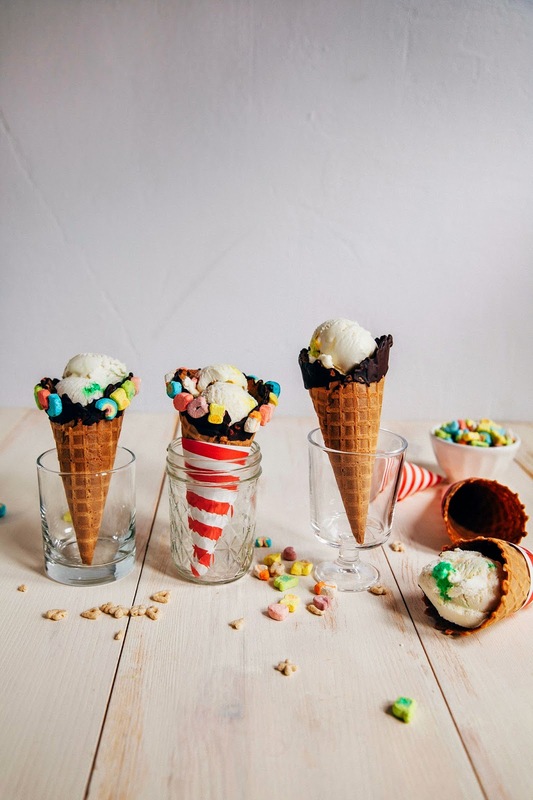 To make this ice cream, I used the cereal and marshmallows from one family size (20.5 ounces) box of Lucky Charms cereal. I hand sorted out the marshmallows, which gave me around 1 1/2 to 2 cups worth of marshmallows (sorry, I'm not exactly sure since I ate a lot of them while I was doing the sorting, lol) that I needed for this recipe. HOWEVER, thanks to comments from my trusty Instagram followers, I found out that you can actually just BUY straight-up marshmallows from Amazon! So do yourself a favor and make your life easier and buy that instead. Toasting the Lucky Charms in the oven before steeping them deepens the flavor of the milk. I didn't add any additional sugar to my steeped milk since I was going to be adding plenty in the ice cream custard base, but if you want your ice cream a little bit sweeter, add up to 2 tablespoons tightly packed light brown sugar. 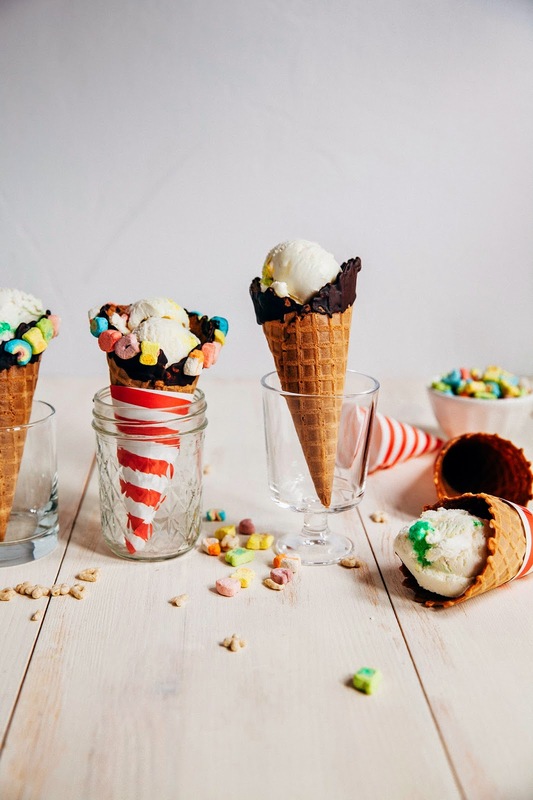 The recipe for Lucky Charms cereal milk below makes more than is needed for the ice cream custard, so you can drink the rest (and it definitely tastes better with a dash or two of sugar). It'll keep in a clean pitcher, refrigerated, for up to 1 week. The ice cream recipe I use is a custard base containing cream, milk, and eggs. Before starting the cooking process, make sure you have the bowl and ice bath ready to cool down your base as soon as its finished cooking. This is essential, since the hot custard will continue to cook for a while, and if you overcook the custard you'll end up with sugary scrambled eggs for ice cream. Which... no thank you. 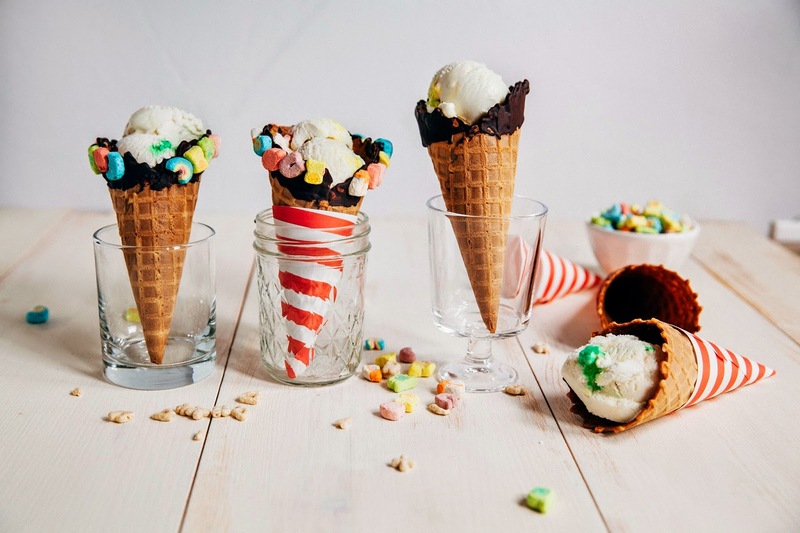 To make the chocolate and marshmallow dipped waffle cones, I used about 1 ounce of melted dark chocolate and 1 tablespoon of Lucky Charms marshmallows per cone. Preheat the oven to 300 (F) and prepare a jelly roll pan or cookie sheet by lining with parchment paper. Spread 2 3/4 cups Lucky Charms cereal on the prepared pan. Bake for 15 minutes until lightly toasted, before turning out onto a wire rack to cool completely. Transfer the cereal to a large pitcher or mason jar. Pour 3 3/4 cups whole milk into the pitcher or jar and stir or shake vigorously for a few seconds. Let steep for 20 minutes at room temperature. Strain the mixture through a fine-mesh sieve over a medium bowl, collecting the milk in the bowl. The milk will drain off quickly at first, then become thicker and starchy towards the end of the straining process. Use the back of a ladle or a spatula to press the mushy cereal to wring more milk out of them, but be careful not to force any of the mushy cereal through the sieve. Whisk 1/4 teaspoon kosher salt into the strained milk until fully dissolved. Refrigerate until ready to use for the ice cream custard. Fill a large bowl or pan with a generous amount of ice and cold water to create an ice bath. Place a large, clean metal bowl in the ice bath and fit the bowl with a fine-mesh sieve. Set aside. In a large, heavy-bottomed saucepan over medium heat, combine 2 cups heavy cream, 1 cup Lucky Charms cereal milk (from recipe above), and 2 teaspoons kosher salt and cook, stirring occasionally, until hot and jusssttt about to boil, but not boiling. Meanwhile, spilt the vanilla bean length wise and use the tip of your knife to scrape out the insides into a medium bowl. Don't throw out the pod though, because you'll need that for later! Add 1 cup granulated sugar and 3 tablespoons malt powder and use your fingers to rub all of it together to incorporate and evenly distribute the vanilla seeds throughout the sugar. Whisk in 3 large egg yolks and 1 teaspoon pure vanilla extract until a uniform color, and return to your cream and milk mixture from the previous step. Remove the cream mixture from heat, and slowly, slowly pour about half of the hot cream mixture into the yolk mixture, whisking constantly. Transfer the yolk mixture back to the saucepan with the remaining cream mixture and return it to medium heat. Cook, stirring constantly with a heatproof rubber spatula, occasionally scraping the bottom of the saucepan to prevent any scorching, until the liquid begins to steam, about 2 to 3 minutes. Remove the custard from heat and IMMEDIATELY pour it through the sieve and into the bowl in the ice bath. Tuck the vanilla bean pod back into the custard. Allow the mixture to cool completely, stirring every 5 minutes or so to release heat. When the custard has completely cooled, cover the bowl and transfer to the refrigerator to steep and chill for at least 1 hour, but preferably overnight. When you are ready to freeze the custard, fish out the vanilla bean pod, and transfer the custard to an ice cream maker and spin according to the manufacturer's instructions. When the ice cream has finished churning and has the consistency of soft serve, transfer to a medium bowl. Use a rubber spatula to stir in 1 1/2 cups to 2 cups of Lucky Charms marshmallows until they are fully incorporated throughout the ice cream. Eat immediately, or transfer to an airtight container to freeze and eat later at your leisure. THIS flavour sounds lovely. Definitely happy to see Lucky Charms being the star in an ice cream. Mmm mmm. Yessssssssss! I like to think my incessant squealing after you told me the lucky charms flavor was back is partially responsible for its inclusion on your blog. Confession: I don't really like marshmallows (for which I am used to getting many looks askance.) BUT. These cones and scoops are so whimsically gorgeous I could never, ever say no. Also—I soooo miss Humphry Slocombe! I totally fantasize about my old SF haunts on the reg. Thanks Katrina! Portlanders are funny, they get up-in-arms about some of the strangest things. That show Portlandia hits a little too close to home sometimes, lol. Hahah, yeah, your enthusiasm definitely made me realize that there was a need for a homemade version of this. No, really. Hahah, no shame! I have very specific requirements for marshmallows — none of that weird jet-puffed stuff, preferably only homemade. Lucky Charms is the exception. Have you tried Malvi or QUIN marshmallows? Malvi has a marshmallow sandwich cookie I adore (hibiscus chocolate, I DIE: http://www.malvimallow.com/) while QUIN has Stumptown coffee ones (http://quincandy.com/). They might change your life! Totally guilty of asking my mom to buy Lucky Charms as a kid and then immediately picking out all the marshmallows. This is so great. And, super congrats on your nomination! 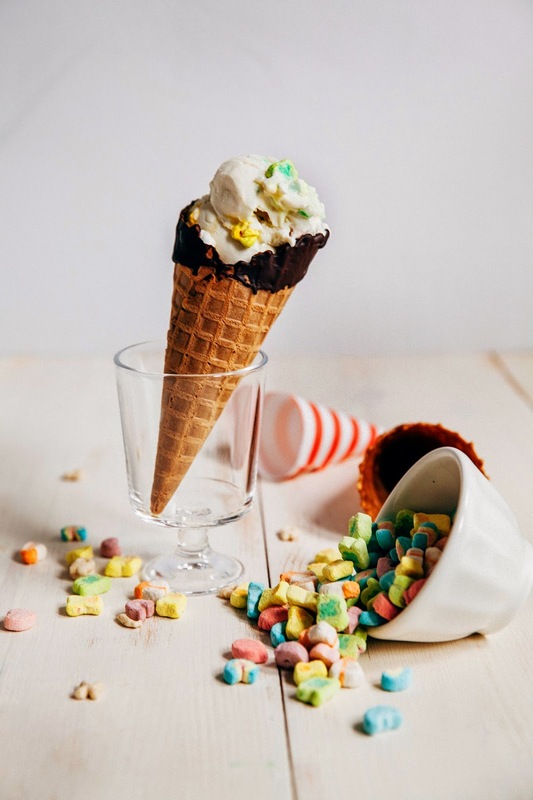 Green leprechauns would pay you their pot of gold for a cone of this lucky charms ice cream! It is so creamy and those ribbons of pale colours are magical. Cereal milk is the best thing since sugar in my books. So as a serial cereal collector I got to get my self some imported marshmallows to Australia. This looks SOOO good MIchelle! This ice cream is incredible, Michelle! I've always been obsessed with Lucky Charms Marshmallows (for years I would spend ages picking them out so I could eat them by themselves- 10-year old me would really have appreciated those amazon packs of just-marshmallows)... so this ice cream is a dream come true. Hahah, thanks for the word count, because anything under 9 is just unacceptable. Thank you, Abby! It's so funny — seems like people only like the Lucky Charms for the marshmallows, lol. Dude. Blood in my ice cream. Never again. Though to be fair, it wasn't as bad as the turkey juice. It actually kinda tasted like cinnamon? Blood pudding ice cream? You are much braver than I. When I was living in London my ex fiancée tried to get me to eat blood pudding and had me watch a documentary on how it was made to help me be more open to it. It backfired to say the least!! I'm with you, simpler flavors paired well together really appeal to me much more. Don't get me wrong, I do love to try new flavors anytime I see them and will try almost anything at least once, but I do draw the line at blood pudding. I can only imagine how delicious this must taste. I know my daughter would go nuts for it! This post is basically my dream. If only lucky charms weren't so hard to get here in Australia.. I would be ALL over this. THIS IS EVERYTHING. I'm literally salivating and alls I need for dinner tonight is this ice cream. I love it Michelle! Okay- I just appreciate how real you are. It's one of my favorite things about your blog besides your photography. ABSOLUTELY not to berate any other blogger with this, but it seems like there is a tendency (and maybe a genuine one) that people just can't believe or accept that they made the list and you just so refreshingly acknowledge here how much hard work you put into blogging, so yes, thank you, please vote for me. I did, in fact, vote for you :) And with hitting both sides of the Salt & Straw critique! Own it girl! Keep bringing' the real talk. I DIE for these photos. And this ice cream. Although, I've never had Lucky Charms, because I don't think they exist in Australia (nor does any marshmallow cereal, sadly) but DAYUM this looks amazing! And I'm with you on the more weird flavours. Honestly: I don't even really dig the whole bacon-in-everything trend. I'm picky, yo. First, CONGRATS!! You totally deserve that awards!! Go you!! omg, what is this documentary on blood pudding and where can I get my hands on it? Aw, thank you Cady! Your comment means so much to me; I try and keep it real around here. And seriously, thanks for the vote! I really appreciate it! Hahha, I admire your dedication to this ice cream!!! No, really! I wish I could send you a pint. Also, PlayDoh as a breakfast cereal prize??? That's amazing. OH GOD THE BAKED BEANS FLAVOR DON'T EVEN GET ME STARTED. it was awful. This is so awesome! I hate regular milk, I can't drink it unless it's flavoured...I'm a big kid. Cereal milk was always my favourite though and I've been dying to make an ice cream out of it for an AGE! Love the photos, they look so fun. I really need to get myself an ice cream maker. You are the best. Seriously, the best. I love love love that you, my fellow lactose-intolerant-ice-cream-lover just made the most magical, over the top ice cream known to man and then had a jug of leftover cereal-milk taunting you in the fridge. High-fives all around. P.s. These photos are AMAZEEE. I am all about their Stumptown coffee with bourbon (Sean is always about the chocolate brownie) and it's easy to get hooked on some of their seasonal flavors (they had this spicy walnut banana deal once and it was SO good). I'm not super into the extra-weird flavors, but I like the novelty and it's always fun to try them and maybe be surprised by something! That article, those comments! Portlanders can be so...Portlandia sometimes, it's true. That say, way to make this at home sans the line! Plus, you get way more scoops this way for way less $$$, HA! I'm going to out and publicly admit this, I've never eaten a single Lucky Charm! 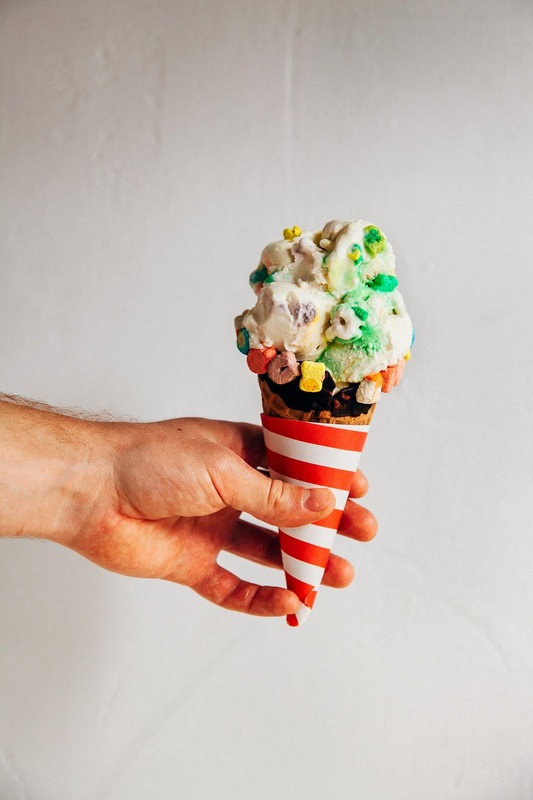 This ice cream and the pop of color with the Lucky Charms makes it look so cute and comforting. okay, literally loads of people i know get really grossed out by milk. you're not alone. and an ice cream maker is worth it. at first i was all like, ugh what is this useless one-purpose tool, but there is actually nothing better than freshly churned ice cream. I HAVE NOT TRIED THEIR MARROW ICE CREAM. i really want to, though! next time it's back in season, we should take a trip there together!!! You know what would be amazing??? If you made some of those macaron cookies of yours and then sandwiched it with this ice cream... yeah? YEAH? Dammit, why don't we live in the same city??!! Yes! I like the inventiveness of their flavors, but the bottom line is their prices can get kinda crazy O_O. I hope they come out with a cookbook soon so we can make some of their flavors at home! amazing, I am loving your ice cream cones dipped in chocolate and colorful marshmallows. Also, as someone who was born and raised in Portland I completely agree with you. Some things (turkey and baked beans) were never meant to mix with ice cream!! But, you're right, when they get it right, they get it sooooo right! And thank you so much for your support in the Saveur Blog Awards! It means the world to me. Word. To all of this. I have such a love/hate relationship with Salt & Straw. Hey, btw your blog is super awesome! We love it! Voted for you over on Saveur. Aw! Thank you for your support! Seriously so stoked when people vote for me. E-hug! THIS IS ALL MY DREAMS COME TRUE. Alllllll I wanted as a kid was a mountain of Lucky Charms marshmallows (the squeakier and staler the better. LOL.) This ice cream is INCREDIBLE, Michelle!!! I need it in my life ASAP. And of course, YAYAYAY Saveur!!! Congrats again lady!!! Ha when you mentioned sorting out the marshmallows I was like noooo I think they can just send you a box of them! Or at least when Kylie Jenner mentioned on Instagram she wanted the marshmallows picked out of Lucky Charms they sent her a box of just the marshmallows. If they'll do it for a Kardashian they'll do it for Hummingbird High! I love Lucky Charms! What a fun recipe! Okay first things first. Sea urchin!!!!!! I need to find myself a goooood (inexpensive ideally) sea urchin to make sea urchin-y dishes soon. And this ice cream is just too amazing! It's so "whimsical" looking first of all, and the custard base makes it that much better. :D It really deserves to be on the website of a creamery. Congrats on the nomination! Throwback cereals in ice cream is always a good decision. I recently did a Cinnamon Toast Crunch flavor… off the chainzzzz. Thanks Caitlin! TBH, I've been daydreaming about a Cinnamon Toast Crunch cereal ice cream... maybe I'll try and develop a recipe when it finally gets warm over here, lol. I can't even imagine how delightful this ice cream must be!!! My BF went to Salt and Straw 5 times during the month of March to eat this ice cream. He's going to be thrilled that I now have a recipe to recreate the magic at home. Thanks! Oooh, what else do they sell at the American Food Store?! I'm so curious! Thanks so much Anne! I really appreciate your support! I'm heading over to vote, this post is a great example of why you were nominated :) I've got an ice cream recipe coming up this week, my first of the season, yay!! Goooosh, those flavours sound amazing (though I agree that I wouldn't like all of them, especially the blood pudding one indeed..)!! Your ice cream looks SO adorable and delicious!! Wish I was there to eat it with you!! I forgot the jingle of the Lucky Charms commercial! I 'm going to cry! Your recipe brings me back childhood memories.